Objective: To determine whether paramedic rapid sequence intubation in patients with severe traumatic brain injury (TBI) improves neurologic outcomes at 6 months compared with intubation in the hospital. Background: Severe TBI is associated with a high rate of mortality and long-term morbidity. Comatose patients with TBI routinely undergo endo-trachealintubation to protect the airway, prevent hypoxia, and control ventilation. 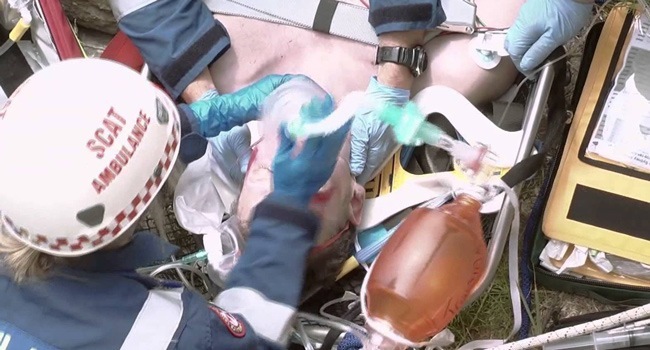 In many places, paramedics perform intubation prior to hospital arrival. However, it is unknown whether this approach improves outcomes. Methods: In a prospective, randomized, controlled trial, we assigned adults with severe TBI in an urban setting to either prehospital rapid sequence intubation by paramedics or transport to a hospital emergency department for intubation by physicians. The primary outcome measure was the median extended Glasgow Outcome Scale (GOSe) score at 6 months. Secondary end-points were favorable versus unfavorable outcome at 6 months, length of intensive care and hospital stay, and survival to hospital discharge. Results: A total of 312 patients with severe TBI were randomly assigned to paramedic rapid sequence intubation or hospital intubation. The success rate for paramedic intubation was 97%. At 6 months, the median GOSe score was 5 (interquartile range, 1–6) in patients intubated by paramedics compared with 3 (interquartile range, 1–6) in the patients intubated at hospital (P = 0.28). The proportion of patients with favorable outcome (GOSe, 5–8) was 80 of 157 patients (51%) in the paramedic intubation group compared with 56 of 142 patients (39%) in the hospital intubation group (risk ratio, 1.28; 95% confidence interval, 1.00–1.64; P = 0.046). There were no differences in intensive care or hospital length of stay, or in survival to hospital discharge. Conclusions: In adults with severe TBI, prehospital rapid sequence intubation by paramedics increases the rate of favorable neurologic outcome at 6 months compared with intubation in the hospital.